Once an unknown karaoke singer, Paul the Rock God is now Canada's fastest growing celebrity! This is the official website of Paul the Rock God. Paul the Rock God burst onto the karaoke scene about 15 years ago. It was clear from the beginning that he was different than all the other karaoke singers. He has a unique style of working the room that gets the audience involved. His popularity just continues to grow! This website also contains the Canada Karaoke Schedule. You can use this schedule for free to find karaoke shows in your city! 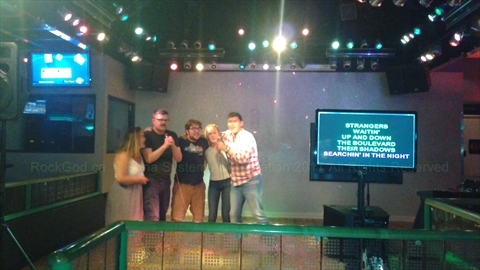 You can also add karaoke shows and comments about karaoke shows in your city! The karaoke schedule shows the dates, times, hosts, venues, and comments about karaoke shows all across Canada! What makes this schedule unique is that is the most up-to-date listing of karaoke shows because users indicate which shows are active! Also, the Canada Karaoke Show Schedule is completely FREE! You can find karaoke shows, add karaokes shows, comment on karaoke shows, etc. all for FREE! The World Karaoke Schedule has moved from this site to KaraokeSchedule.com. If you are looking for karaoke shows outside of Canada please check out this schedule.